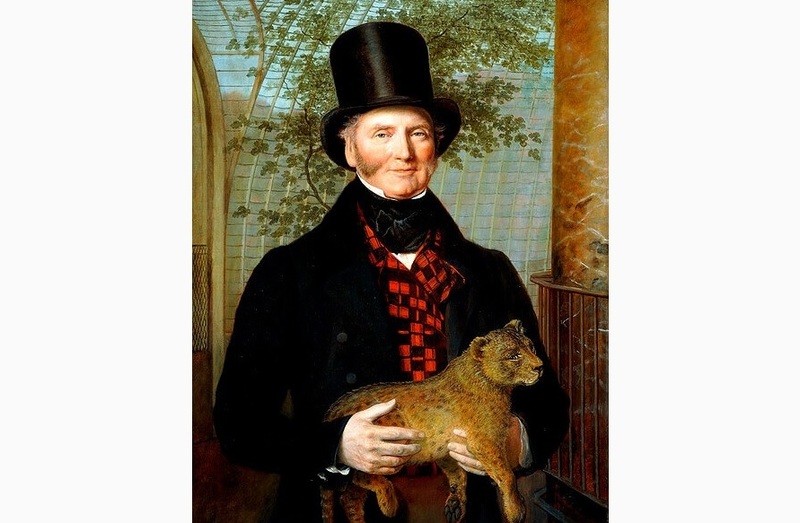 If you have read our earlier post on Edward Cross, you will remember that he was the proprietor of a menagerie in Regency London. The menagerie, which perched on the upper floors of Exeter Change in the Strand, had many remarkable features. None, though, was more remarkable than its resident elephant. The elephant—Chuny or Chunee—had originally been imported from Kolkata, or, as it was then, Calcutta. However, seeing as he spent the best part of his life in the Strand, he can be thought of as an honorary Londoner. What follows is his strange, tragic and decidedly macabre story. 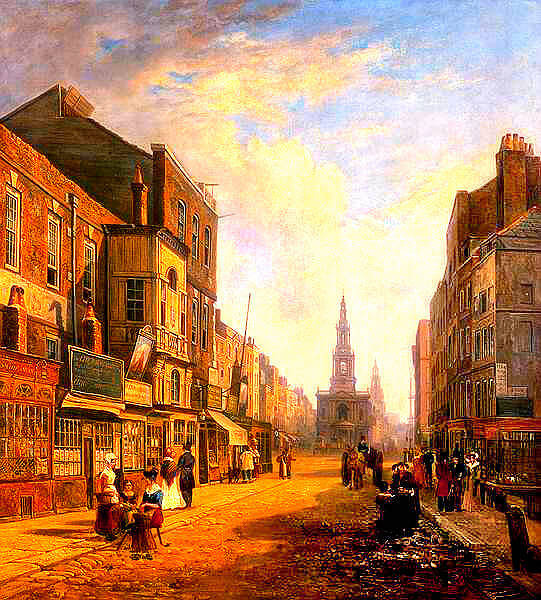 Brought to England in 1811 by the captain of an East India Company ship, Chuny was immediately bought by Henry Harris, the manager of the Theatre Royal in Covent Garden. 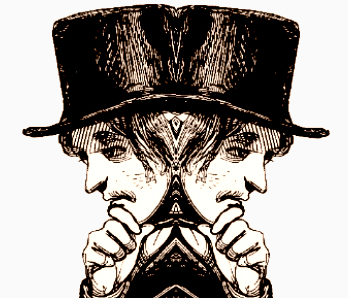 Harris gave him a starring role in a low-brow harlequinade, but his behaviour was erratic, and, ridiculed by audiences and critics alike, he was hastily withdrawn after only thirty-eight appearances. Harris was forced to let Chuny go, and in February 1812 he was led off to Exeter Change. And here, a question. Just how do you get an Asian elephant through the streets and up the stairs to the first floor of a rickety old London building? 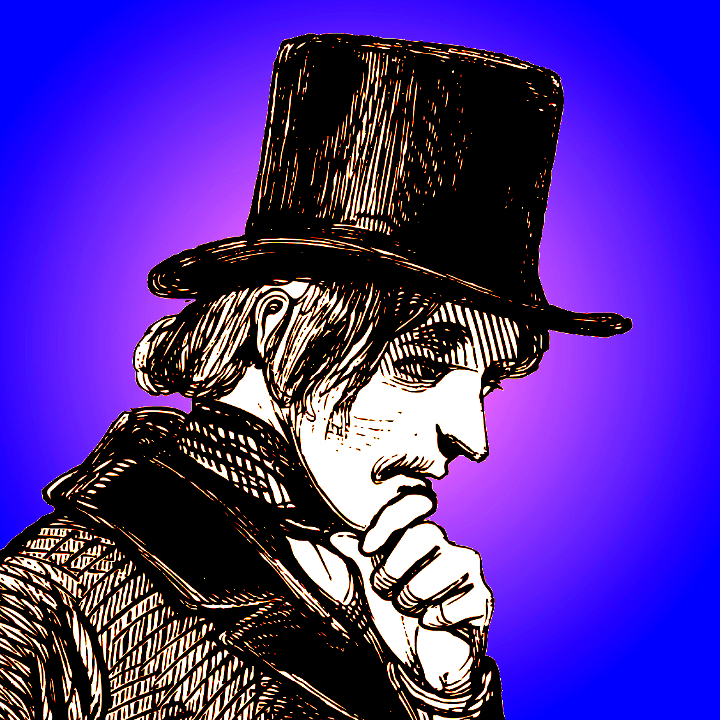 The menagerie had passed through several pairs of hands, from Gilbert Pidcock to Stephan Polito—a showman of questionable tastes who had once toured the country with an exhibition of goitrous Alpine peasants—to the redoutable Edward Cross. The last of these gentlemen was a splendid entrepreneur who loved the elephant almost as much as he loved money. He reckoned it his most valuable asset—and he was not wrong—and he insured it for the very considerable sum of five hundred pounds. For a while, Chuny was indisputably Cross’s greatest asset. There are many stories about Chuny. He was trained to ring the bell for the menagerie supper every evening at nine o’clock. He could use his trunk to take a penny from his keeper to buy food from an old cake-seller. He once punished a fashionable gent who had casually jabbed a pin into his trunk by tearing his costly topper to shreds. He was courted by actors, who recognised in him a fellow celebrity. He was subjected to every sort of scrutiny. The noble surgeon Sir Everard Home even had a piano hauled up to the menagerie to test Chuny’s musicality, which, as Science was no doubt the richer for discovering, Chuny conspicuously lacked. Chuny’s den as depicted in William Hone Every-Day Book volume 2 (1827) pages 335 and 336. But as time went by Cross was increasingly bedevilled by practicalities. Chuny had grown, as young elephants invariably do, so much so that at a height of ten feet or more, and at a weight of about five tons, he had outgrown his den. He had become fretful, and, when roused, looked more than capable of breaking down the bars. Cross paid a handsome three hundred and fifty pounds to have the den enlarged and strengthened—and of course he advertised the mighty new structure on handbills and flyers and in the notices that he placed in the press—but he was merely delaying the inevitable. Chuny was at his most dangerous under the influence of the musth, which Cross tried but failed to control with biblical quantities of purgatives and emetics. Keepers were attacked, and one, a German by the name of Johann Tietjen, was actually killed. Fearing for his reputation, Cross tried to sell Chuny for five hundred pounds to an American showman who was then travelling through England. But a ship’s captain willing to take such a creature on the long voyage across the Atlantic could not be found, and the deal fell through. The tragic death of Chuny. Image in Once a Week 14 November 1863. The storm finally broke in 1826, when in yet another assault on the bars of his den Chuny damaged a tusk. A splinter of ivory set up an inflammation in the pulp of the tusk, and, maddened by the pain, Chuny went berserk. Long after the event, expert opinion decided that the inflammation might have been treated. But Cross, who had not the foggiest idea what had happened, was not unnaturally driven to take drastic measures. He tried to kill Chuny, first with poison, and then, when he refused the poison, with a hail of musket balls fired by soldiers rounded up from the barracks at Somerset House. 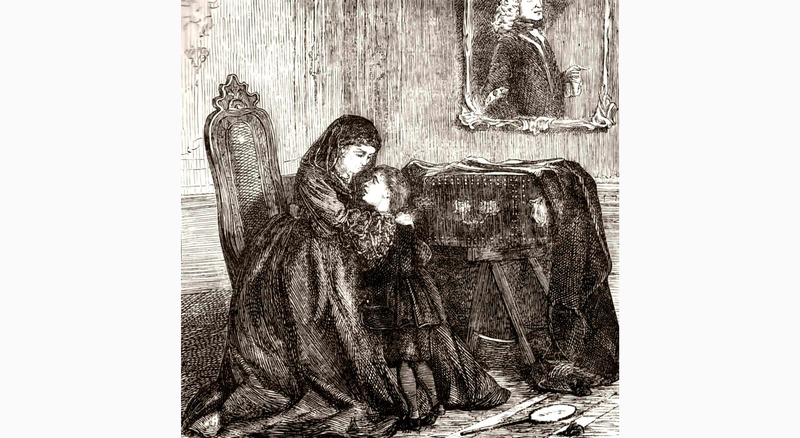 In the end the coup de grâce was delivered by Cross’s brother-in-law, one William Herring, firing at Chuny’s throat, and, as a post mortem precaution, into his ear. Visitors viewing Chuny’s corpse by gaslight. Image in The Mirror of Literature Amusement and Instruction 11 March 1826. The whole ghastly business lasted an hour and a half, and all the while crowds had been gathering in the street outside, drawn by the sound of muskets and by Chuny’s pitiful bellowing. Only too aware of the financial loss he had incurred, Cross kept the menagerie open late, taking thirty-five pounds at the door from ghoulish members of the public. He set up flaring gas cylinders that cast their light into the corners of the den, just bright enough for the keepers to point to the wounds in Chuny’s head and body and to the quantities of blood on the floor. The pressmen were there too, writing the articles that would be rushed into print—with many factual errors—in the next day’s papers. The killing in the menagerie would become a sensation, literally overnight, and on a magnificent scale. Cross took two hundred and fifty pounds in the first three days, but the problem of a rotting five-ton carcass had to be addressed. Under pressure from the local magistrate, who was clearly concerned about the risk to public health, he invited assorted anatomists and scientists to dissect the dead Chuny. The carcass was flayed by a nine-strong team of butchers, who sweated hour after hour over their task while Cross’s keepers mopped up blood and poured buckets of perfumed disinfectant over the floor of the den. Only when the revolting work was finally done did the anatomists begin slicing and sawing, and examining and measuring the inner mechanisms of the stupendous beast. Anatomists dissecting Chuny. Image in The Spirit of the Times 29 April 1826. The exhausted butchers dragged the hide down the stairs to the street and heaved it on to a waiting cart. Creaking under its load, the cart pulled off, bound we know not where, though rumour had it that the hide had been bought by a tanner called Davis for the sum of fifty pounds. The flesh was taken away on a fleet of carts to the knacker’s yard in Sharpe’s Alley in Cow Cross, where it was “processed”, and whence it ended up in goodness knows what animal’s feeding bowl, or on goodness knows what unsuspecting wretch’s dinner plate. As for Chuny’s intestines, the story goes that they were carted off late one night down Wellington Street to Waterloo Bridge, dropping into the river with a splash heard only by a few midnight strollers and by the prostitutes who haunted such places. Thus did the last of Chuny go to join the sewage, the household slops, the effluent from factories and the dead animals that made up the peculiar “soup” of the Thames. Notice of an auction on 2 April 1929 in which the main attraction is Chuny’s hide. But Chuny lived on in a number of strange ways. A plaster cast of his noble head made by the phrenologists James De Ville and son was displayed in their workshop in the Strand alongside the crania of madmen and executed criminals. 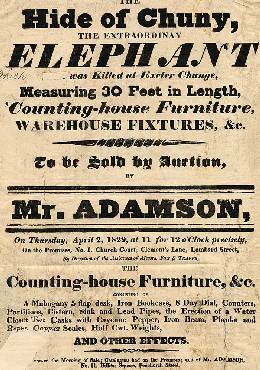 And the one-ton hide, which Mr Davis had treated at his tannery in Greenwich, was cut up and sold off, the main piece fetching thirty-three pounds twelve shillings and sixpence at an auction in Leadenhall Street leather market, and smaller pieces being bought either by the leather workers who specialised in luxury articles or by collectors of curios. One such piece, about the size of a small pocket diary, is still sitting in a little museum in Saffron Walden, where it was deposited in 1837 by a member of a prominent Essex family. Even Chuny’s hair had its devotees, and a man by the name of John Ranking actually obtained samples from Cross to back up his rather eccentric research. The skeleton of Chuny in the Hunterian Museum. Image in The Illustrated London News 4 October 1845. Chuny’s bones did not remain at Exeter Change for long. Cross had struck a deal with an enterprising Staffordshire man, Walter Horton Bentley, who was a shoemaker by trade but a taxidermist of sorts by inclination. Bentley re-articulated the skeleton, and exhibited it in regional assembly rooms. A reporter in Liverpool was astonished at the size of it, and wrote rapturously that “we felt as though we were a pygmy at the foot of a giant”. In time, and with more than a passing thought for the money that he hoped he might make, Bentley hauled the skeleton back down to Exeter Change, where for a while it stood again in its old den, drawing the crowds, until with the closing of the menagerie it was sent off to the Egyptian Hall in Piccadilly. The last home of Chuny’s bones was the Hunterian Museum in the Royal College of Surgeons, and it was there that in the Blitz of 1941 it was finally destroyed by German bombs. But the most enduring survival of Chuny was the memory of him. In the immediate aftermath of his death he became the subject of a one-act Sadler’s Wells sketch by the actor Mr Campbell, of satirical letters in The Morning Post, and of truly dreadful poems by the humourist Thomas Hood. Long after the terrible events in the Strand his story was recalled, his name serving as a by-word for dangerous madness, or for vast physical bulk―for “ponderosity”, as a novel of 1831 put it, rather ponderously. 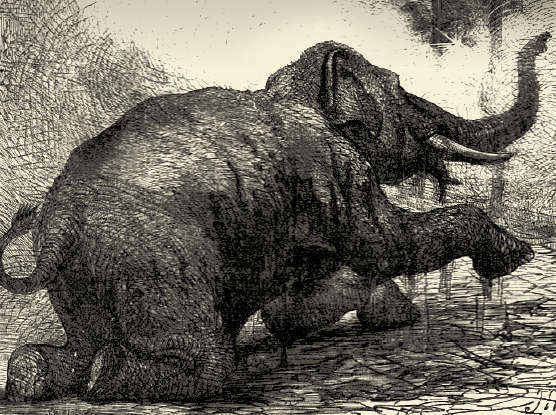 “Destruction of the Furious Elephant at Exeter Change”. Aquatint by George Cruikshank dated 1826. He was depicted by artists and illustrators before, during and after his destruction: a print by George Cruikshank was still a sought-after item decades later. 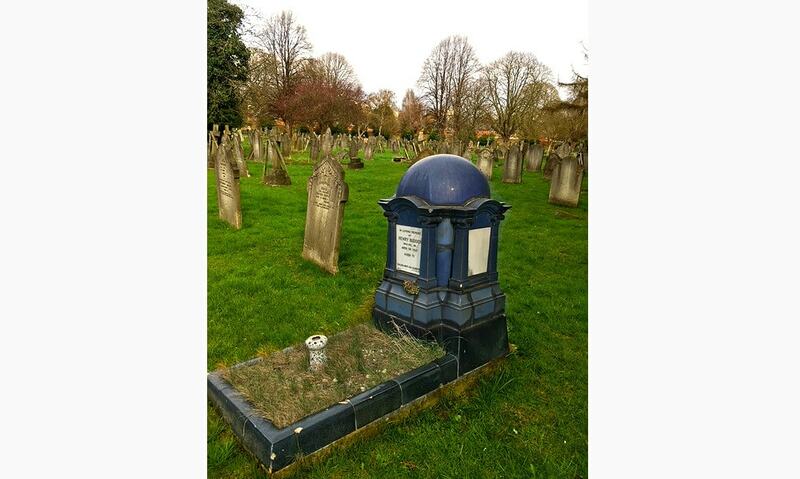 He was remembered by Charles Dickens as an example of London’s dark history—what a memorial!—for all that Dickens had only been a boy of fourteen in the early spring of 1826. And, in another link with Dickens, he featured in a jingle advertising Warren’s Blacking. Why? Well, because the infamous blacking factory stood in the Strand, and not, we are glad to say, because any part of him had been used in the manufacture of boot polish. The material for this post has been drawn from the research I carried out in writing The Elephant of Exeter Change, which can be downloaded here.